Stephen Harper's spokesperson ripped into Justin Trudeau ahead of Thursday's highly anticipated leaders' debate. Kory Teneycke says expectations for Trudeau have "probably never been lower for a leader going to a debate." Stephen Harper's spokesperson ripped into Justin Trudeau ahead of Thursday's highly anticipated leaders' debate. 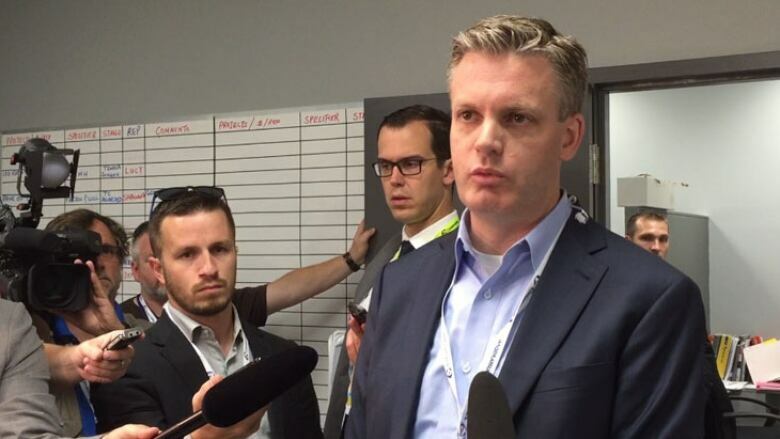 Kory Teneycke says expectations for Trudeau have "probably never been lower for a leader going to a debate." "I think that if he comes on stage with his pants on, he will probably exceed expectations," Teneycke said in an interview Tuesday during a campaign stop in Toronto. Trudeau has likely spent hours memorizing "a lot of attacks" and rehearsing "pithy responses," but there's a big difference between that and understanding how to manage an economy, he said. "At the end of the day, this isn't a debate just for the sake of a debate. It is to pick somebody who is capable of managing that $1.9-trillion economy," Teneycke said. "There's only one candidate on the stage with a proven track record with respect to managing our economy, and that's Stephen Harper." In a statement, Trudeau spokeswoman Kate Purchase did not address Teneycke's comments directly. "Mr. Trudeau's priority in the debates is the same as his priority for the entire campaign," Purchase said. "He will speak directly to Canadians about his plan to get the economy going by strengthening the middle class." Thursday's debate in Toronto is being hosted by Maclean's magazine and includes Harper, Trudeau, NDP Leader Tom Mulcair and Green party Leader Elizabeth May.